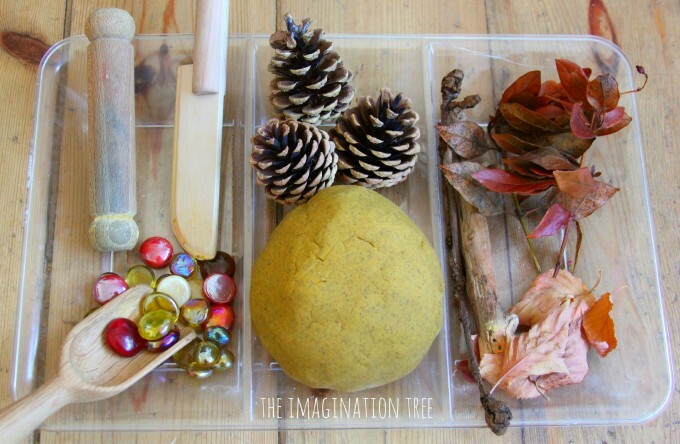 Make this wonderfully warm scented Autumn spice play dough recipe for lots of Fall themed invitations to play and learn! Natural materials and loose parts make a great combination with this themed play dough and are a great way to explore patterns and shapes in nature. 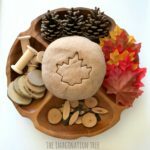 We make a new batch of our best ever, no-cook play dough recipe every month, and usually add some different ingredients to change the theme each time. 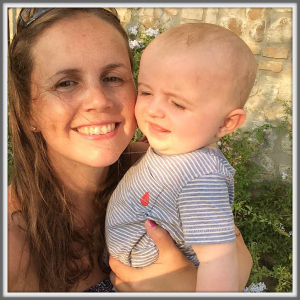 We now have an archive of over 50 playdough recipes, themes, invitations to play and learning ideas on this blog, so you will never need another idea again if you search through those and pin your favourites! 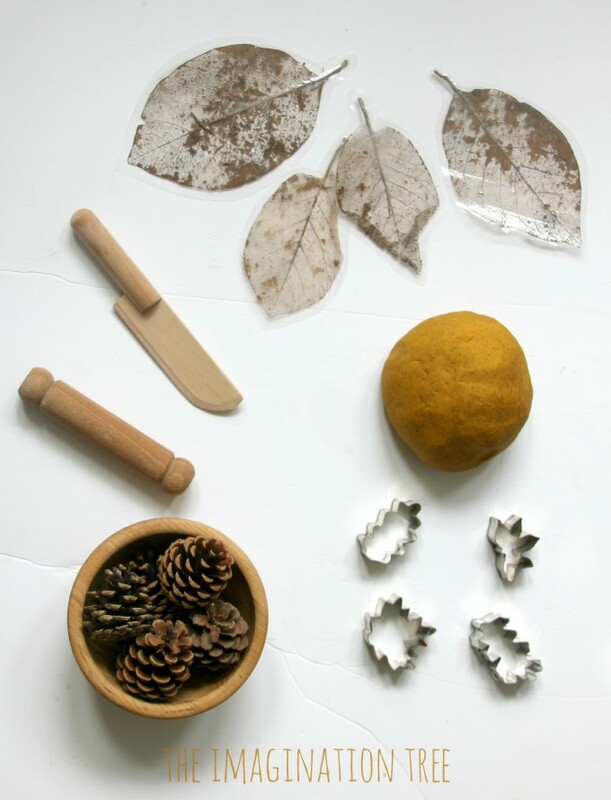 Each autumn and winter we make play dough recipes with gorgeous spices and warm scents and I think they’re amongst my most favourite. 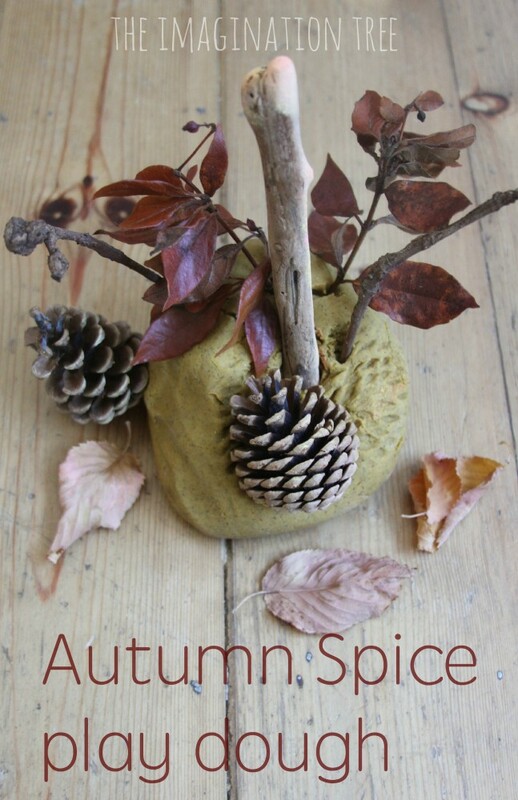 Coupled with natural materials that are so readily available to find in the parks and woods, Autumn spice play dough can be one of the most inviting little play set up of all, with textures and patterns to imprint and explore. 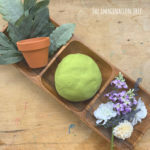 To our usual no-cook play dough recipe [Click the link to read] I simply added 1 tablespoon of Allspice right at the end of the mixing process, and kneaded it in thoroughly. 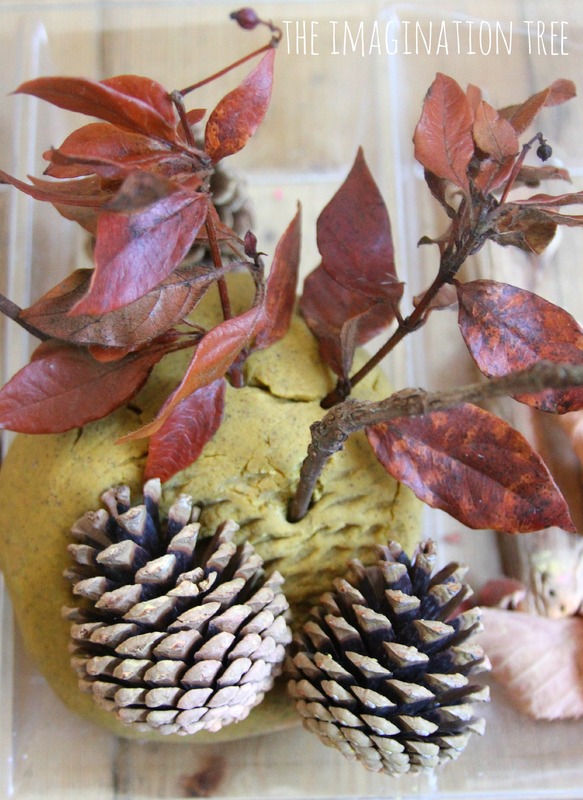 We coloured the boiling water with orange Wilton gel colours (the only colours that really give a vibrant hue) and the combination of colour and spices makes this such a warm dough to work with! 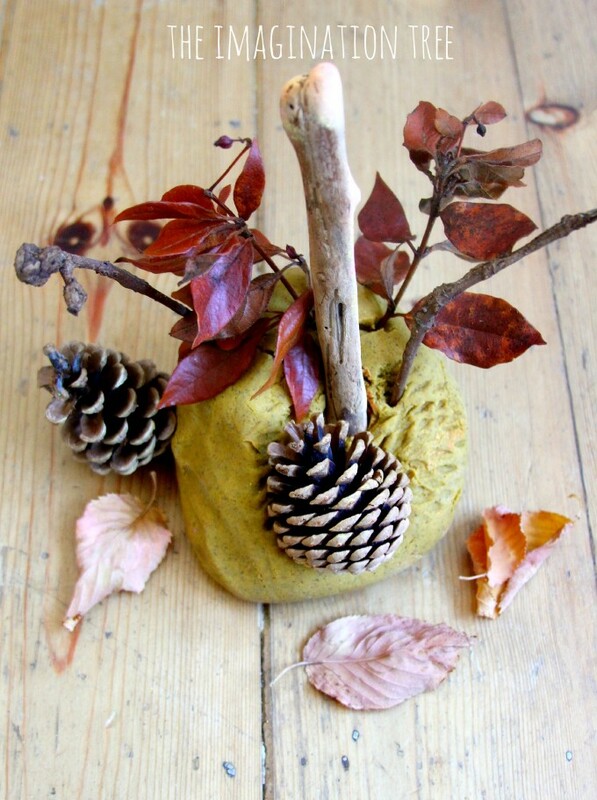 I set this out as an Invitation to Play with some twigs with leaves on, pine cones, coloured glass gems, driftwood and some skeleton leaves (which we had laminated two years ago.) 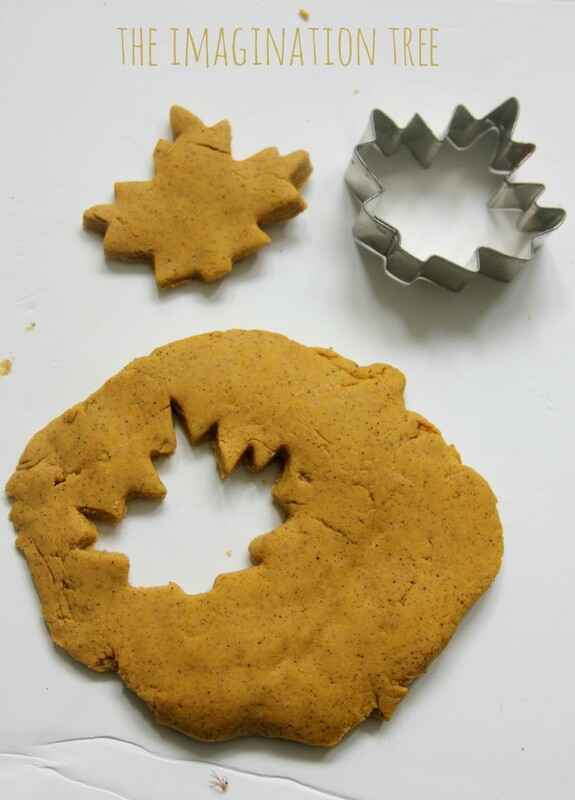 I also added leaf shaped cutters and a wooden rolling pin and knife. 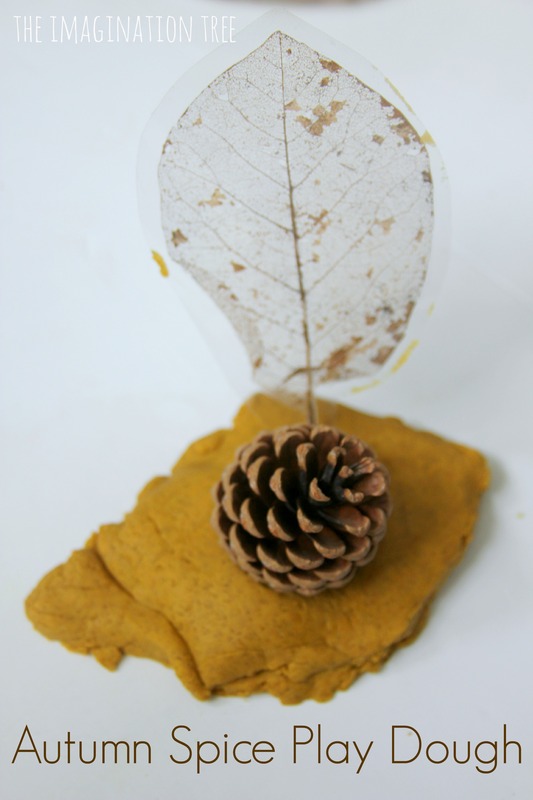 The kids loved cutting leaves, making spice pies, rolling the pine cones to create patterns and sticking the twigs and skeleton leaves to create little forests for play. 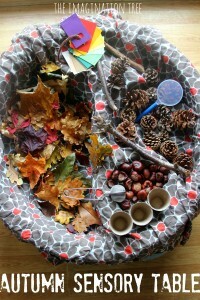 We also gave a batch of this to Miss 3s nursery class who have been enjoying it on their sensory table this week too! I like to set these out in sectioned party platters which you can buy from all supermarkets, as this keeps some of the materials in compartments and makes them accessible for free choice. 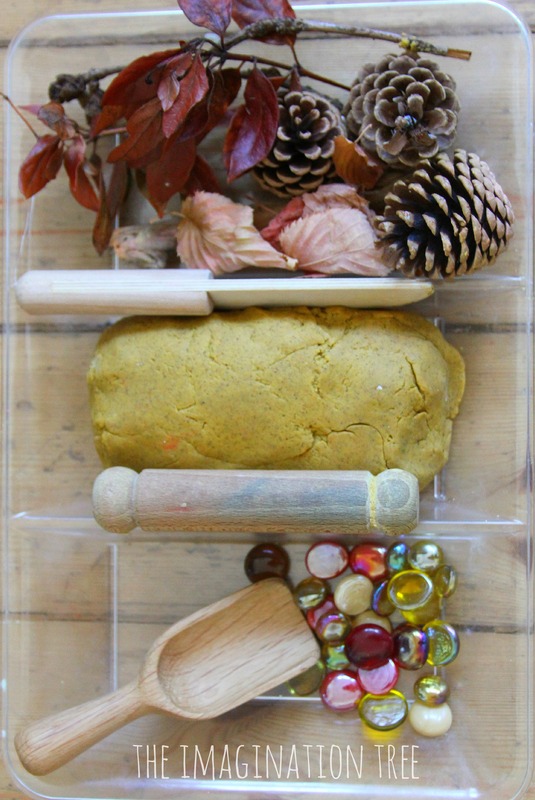 Ikea also has a great compartmentalised box which they sell for craft material storage, which works brilliantly for storing play dough and themed loose parts together. 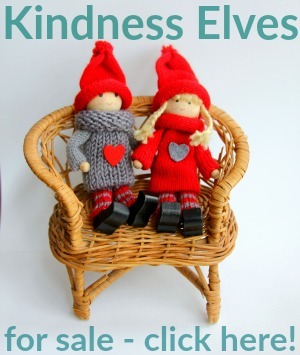 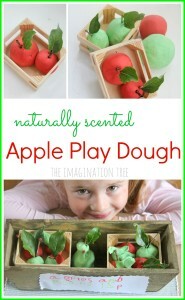 Follow my Play dough and Salt dough Pinterest board here!